While Canadian astronaut Chris Hadfield works and tweets from orbit, his country's space agency is engaged in battles on the ground. In recent months, the Canadian Space Agency has faced budget cuts and an aerospace review that said it was suffering from "ad hocery" in government funding and planning. It's still unclear how this will affect Canada's human spaceflight program. The agency remains committed to International Space Station work until at least 2020, which keeps the door open for two trainees awaiting flights to the orbital laboratory. But as the CSA faces a large drop in funding between 2013 and 2015, agency president Steve MacLean has declined to comment on where cuts could fall. agency's budget was disclosed last March in Canada's national budget. A large part of Hansen's job is getting the word out about the agency's work, often with school groups. He said he has a "unique perspective" as a space insider and is glad to share it with any audience that might be interested, including those holding the purse strings. When asked about the bright spots in Canadian human space exploration, Hansen pointed to the close links the CSA has with NASA, particularly in the field of commercial spaceflight. SpaceX is flying cargo to the International Space Station under a NASA contract, and soon other companies will be, too, he pointed out. SpaceX is among those firms working toward rating their commercial spacecraft for human spaceflight in the next decade. "I think we see a turning point in space exploration," Hansen said of NASA's contracts with these companies. This work will translate to more science and spaceflight opportunities for Canada, he said. Canada's commitment to the station leaves Hansen and fellow Canadian trainee David Saint-Jacques with at least seven years to make it to orbit. Hansen is often asked when he will be assigned, then told by the questioner that he must be disappointed at the years-long wait. But he said his feelings are quite the opposite, as there is so much work to be done before then. "I knew what I was signing up for," he said. "You can't predict exactly. It could be faster or it could be longer." A Jan. 8 article in Space News hinted the CSA's budget cuts could go even deeper. MacLean said his agency's budget will be $257 million to $259 million ($258 million to $260 million in Canadian dollars) by 2014 or 2015, Space News reported. By comparison, the agency's budget in 2013-14 is about $308.7 million ($309.7 million Canadian), down 20 percent from 2012-13. In the Space News report, MacLean hinted the reductions could be counteracted by doing more work with other government departments. Money available for human space exploration and technology spinoffs, the Canadian Space Agency stated in May, would decline from $105.9 million ($106.3 million Canadian) in 2012-13 down to $92.7 million ($93 million) in 2014-15. In the same time period, 8 full-time job equivalents could be cut, bringing the work force in that segment to 188 people. But CSA officials emphasized the importance of the space station in remarks accompanying the financial statements. 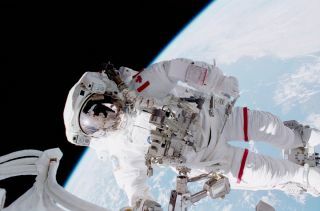 "Canada will continue as an active partner and participant in the International Space Station," the report stated, adding "flight opportunities for Canadian astronauts" would be one of the priorities.